Join us as Chet demonstrates bird training techniques and Casey performs his many talents for you! I am a life long resident of Columbia, Pa. In 1993 I retired from the Armstrong World Industries Research and Development Center, Lancaster, PA. My wife, Joyce, and I have been married for 34 years. She shares my love for parrots. I have been keeping birds since 1987. I started with a little Zebra Finch, then added three more pairs of finches. In 1989, Cinders, a Cockatiel – my first parrot, showed up. In 1990, Casey Jones, a Congo African Grey, stole my heart. The birds loved interaction, so I began teaching them a few tricks. As their list of “behaviors” or tricks grew, the birds enjoyed showing off for friends and guests. The flock continued to grow. I began demonstrating “pet bird tricks” in the fall of 1993 at a Central Pennsylvania Caged Bird Club, bird show, in Grantville, Pa. I used two of my talented parrots to attract people to the bird club table. In Oct. of 1994, Joyce and I helped with a combined pet bird and reptile show at a large Boy Scout meeting. After several more local bird shows, the number of requests increased rapidly and “CASEY and COMPANY” – my trick parrot show – was off and running. During the show we told stories about each bird and discussed their native habitats. Many of the birds performed tricks. 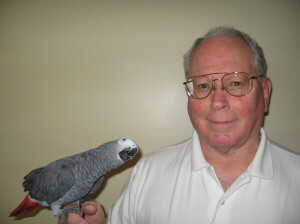 Casey Jones, the star of the show demonstrated parrot intelligence by picking up the proper number of objects according to shape, size and color. He will do many other behaviors on command. A show was about 60 minutes long, included eight to ten parrots and was followed by about 30 minutes of supervised touching and holding of the gentler birds. We performed over 250 trick parrot shows from 1994 to 2004. I was a speaker at the 1999 Canadian Parrot Symposium in Toronto, Canada. In 2000 we were invited to do a slide program, followed by a live trick bird demonstration (by Casey Jones) – for both The Minnesota Companion Bird Association in Minneapolis, Minnesota and The Central Jersey Bird Club, in Somerville, NJ. In 2004 I had to retire “Casey and Company” because of health problems. Joyce and I contributed text and photographs for Pamala Hutchinson’s book, “Complete Guide To African Grey Parrots”. Joyce took the pictures while Casey Jones and I demonstrated the tricks. Two of my articles were published in Sally Blanchard’s Companion Parrot Quarterly magazine. I am presently owned by a handicapped Senegal Parrot, Dara; a Congo African Grey Parrot, Casey Jones; and a Greenwing Macaw, Sierra. Our mission is to educate ourselves on every aspect of owning and caring for all types of parrots. Among our goals is raising funds to support Avian Medical Research projects, Rescues/Sanctuaries, and conservation efforts related to parrots. The Real Macaw Parrot Club is an educational all species bird club.